Fabricated size is 172″L X 40″W. Beauty and Grace…the epitome of our remarkable runner line?Graceful Table Drapes. Made of an elegant chiffon, most commonly seen in fashionable formal wear, it is loved for its ability to drape well, and adds an ethereal flowy appearance. Our Gracefuls are rich in color (and offered in ten stylish hues), which will add the right amount of glamour to any event you dream. Our White Graceful is clean, crisp and pure, that will add the perfect touch of sophistication. With no seams or restrictions, our Table Drapes are fashioned to cascade down the sides of your tables exquisitely to create effortless beauty.? Explore your creativity and share with us your stylish designs. Fabricated size is 172″L X 40″W. 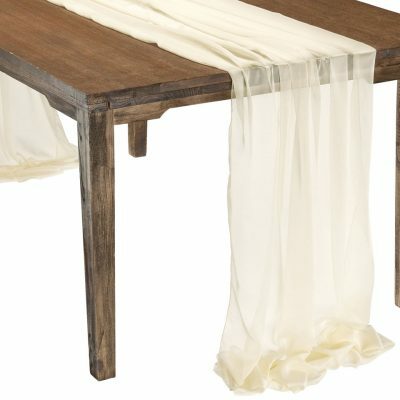 Beauty and Grace…the epitome of our remarkable runner line?Graceful Table Drapes. Made of an elegant chiffon, most commonly seen in fashionable formal wear, it is loved for its ability to drape well, and adds an ethereal flowy appearance. Our Gracefuls are rich in color (and offered in ten stylish hues), which will add the right amount of glamour to any event you dream. Our Ivory Graceful is a warmer creamy neutral tone, that will add just the perfect mix for all colors. With no seams or restrictions, our Table Drapes are fashioned to cascade down the sides of your tables exquisitely to create effortless beauty. Explore your creativity and share with us your stylish designs. Fabricated size is 172″L X 40″W. Beauty and Grace…the epitome of our remarkable runner line?Graceful Table Drapes. Made of an elegant chiffon, most commonly seen in fashionable formal wear, it is loved for its ability to drape well, and adds an ethereal flowy appearance. Our Gracefuls are rich in color (and offered in ten stylish hues), which will add the right amount of glamour to any event you dream. Our Daffodil Graceful is a joyous, happy golden yellow glow, that will add just the right delight. 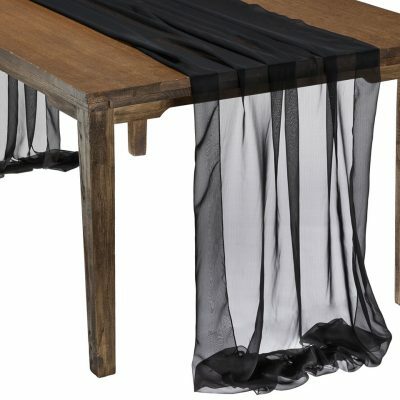 With no seams or restrictions, our Table Drapes are fashioned to cascade down the sides of your tables exquisitely to create effortless beauty.? Explore your creativity and share with us your stylish designs. Fabricated size is 172″L X 40″W. Beauty and Grace…the epitome of our remarkable runner line?Graceful Table Drapes. Made of an elegant chiffon, most commonly seen in fashionable formal wear, it is loved for its ability to drape well, and adds an ethereal flowy appearance. Our Gracefuls are rich in color (and offered in ten stylish hues), which will add the right amount of glamour to any event you dream. Our Gold Graceful is a warmer brownish golden tone, that will add just the right glamour. 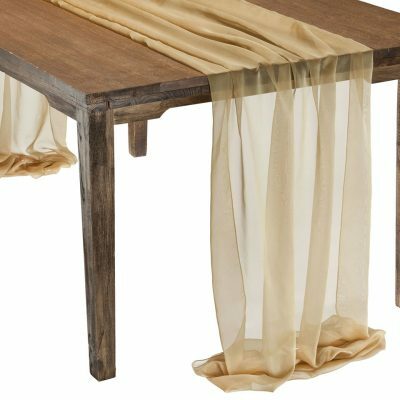 With no seams or restrictions, our Table Drapes are fashioned to cascade down the sides of your tables exquisitely to create effortless beauty.? Explore your creativity and share with us your stylish designs. Fabricated size is 172″L X 40″W. Beauty and Grace…the epitome of our remarkable runner line?Graceful Table Drapes. Made of an elegant chiffon, most commonly seen in fashionable formal wear, it is loved for its ability to drape well, and adds an ethereal flowy appearance. Our Gracefuls are rich in color (and offered in ten stylish hues), which will add the right amount of glamour to any event you dream. Our Mandarin Graceful is two-tone softer bright orange and yellow, that will add just the right intriguing wonder. With no seams or restrictions, our Table Drapes are fashioned to cascade down the sides of your tables exquisitely to create effortless beauty. Explore your creativity and share with us your stylish designs. Fabricated size is 172″L X 40″W. Beauty and Grace…the epitome of our remarkable runner line?Graceful Table Drapes. Made of an elegant chiffon, most commonly seen in fashionable formal wear, it is loved for its ability to drape well, and adds an ethereal flowy appearance. Our Gracefuls are rich in color (and offered in ten stylish hues), which will add the right amount of glamour to any event you dream. Our Leaf Graceful is a glowing green with a hint of yellow, that will add just the right floral backdrop. With no seams or restrictions, our Table Drapes are fashioned to cascade down the sides of your tables exquisitely to create effortless beauty. Explore your creativity and share with us your stylish designs. Fabricated size is 172″L X 40″W. 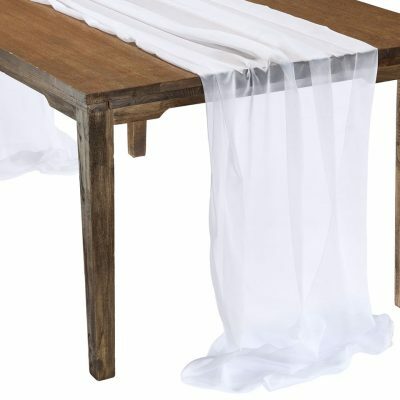 Beauty and Grace…the epitome of our remarkable runner line?Graceful Table Drapes. Made of an elegant chiffon, most commonly seen in fashionable formal wear, it is loved for its ability to drape well, and adds an ethereal flowy appearance. Our Gracefuls are rich in color (and offered in ten stylish hues), which will add the right amount of glamour to any event you dream. Our Royal Graceful is a traditional primary color and revels in the deepest of blues you will find in the ocean depths. With no seams or restrictions, our Table Drapes are fashioned to cascade down the sides of your tables exquisitely to create effortless beauty. Explore your creativity and share with us your stylish designs. 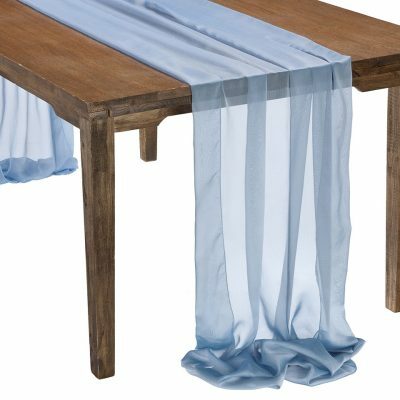 Made of an elegant chiffon, most commonly seen in fashionable formal wear, this dusty blue Serenity Graceful table drape is loved for its ability to drape well, and adds an ethereal flowy appearance. Our Gracefuls are rich in color (and offered in ten stylish hues), which will add the right amount of glamour to any event you dream. This one-of-a-kind Graceful is a traditional primary color and revels in the deepest of blues you will find in the ocean depths. With no seams or restrictions, our Table Drapes are fashioned to cascade down the sides of your tables exquisitely to create effortless beauty. Explore your creativity and share with us your stylish designs. Fabricated size is 172″L X 40″W. 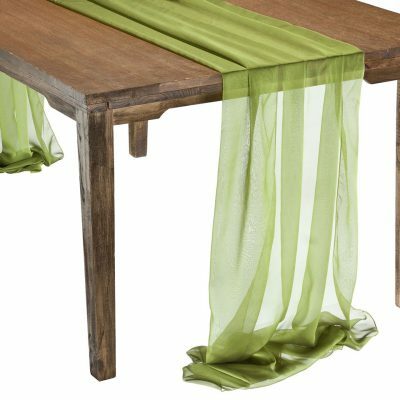 Beauty and Grace…the epitome of our remarkable runner line?Graceful Table Drapes. Made of an elegant chiffon, most commonly seen in fashionable formal wear, it is loved for its ability to drape well, and adds an ethereal flowy appearance. Our Gracefuls are rich in color (and offered in ten stylish hues), which will add the right amount of glamour to any event you dream. Our Blush Graceful is soft, romantic Cameo pink, that will add the perfect touch of romanticism. 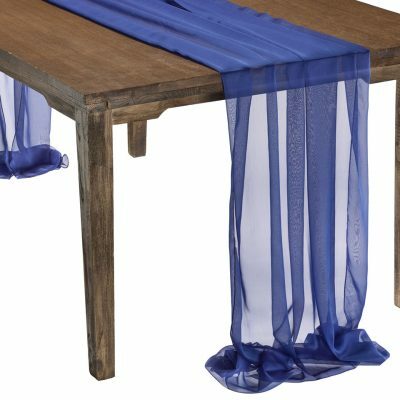 With no seams or restrictions, our Table Drapes are fashioned to cascade down the sides of your tables exquisitely to create effortless beauty.? Explore your creativity and share with us your stylish designs. 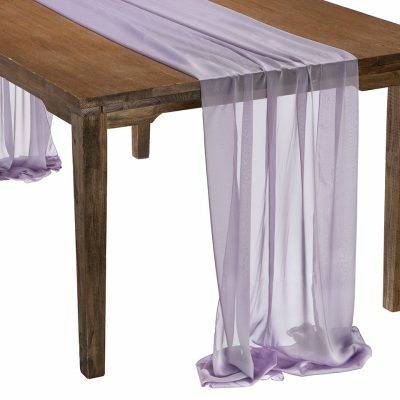 Made of an elegant chiffon, most commonly seen in fashionable formal wear, this dusty lilac Sugarplum Graceful table drape is loved for its ability to drape well, and adds an ethereal flowy appearance. Our Gracefuls are rich in color (and offered in ten stylish hues), which will add the right amount of glamour to any event you dream. This one-of-a-kind Graceful revels in the deepest of purples. With no seams or restrictions, our Table Drapes are fashioned to cascade down the sides of your tables exquisitely to create effortless beauty. Explore your creativity and share with us your stylish designs. Made of an elegant chiffon, most commonly seen in fashionable formal wear, this Silver Graceful table drape is loved for its ability to drape well, and adds an ethereal flowy appearance. Our Gracefuls are rich in color (and offered in ten stylish hues), which will add the right amount of glamour to any event you dream. This unique Graceful features a beautiful silver that can complement nearly any table design. With no seams or restrictions, our Table Drapes are fashioned to cascade down the sides of your tables exquisitely to create effortless beauty. Explore your creativity and share with us your stylish designs. Fabricated size is 172″L X 40″W ? Beauty and Grace…the epitome of our remarkable runner line?Graceful Table Drapes. Made of an elegant chiffon, most commonly seen in fashionable formal wear, it is loved for its ability to drape well, and adds an ethereal flowy appearance. Our Gracefuls are rich in color (and offered in ten stylish hues), which will add the right amount of glamour to any event you dream. Our Black Graceful is a deep ink black, that will add just the right elegance. With no seams or restrictions, our Table Drapes are fashioned to cascade down the sides of your tables exquisitely to create effortless beauty. Explore your creativity and share with us your stylish designs.